Last month marked the launch of two new Littoral Combat Ships: Milwaukee (LCS 5) launched by Marinette Marine into the icy Menominee River; and Jackson (LCS 6) launched by Austal into the far warmer waters found off of southern Alabama. While the two LCS variants and shipyard climates are a world apart, this innovate U.S. Navy ship production program has the common goal of fortifying U.S. defense interests while spurring investment in the creation of two state-of-the-art ship production facilities. Mid-December in Marinette, Wis., can be described with one word: cold. December 18, 2013 did not disappoint, as the temperature hovered just above zero for the ceremony to launch LCS 5, Milwaukee, into the Menominee River at Marinette Marine. While the temperature was cold, the mood was not, as hundreds of dignitaries, shipyard workers and their families were on hand as the Lockheed Martin-led industry team commandeered the side launch of Milwaukee into the Menominee River, which required icebreakers to work throughout the morning to create an ice-free space for the ship. Marinette Marine builds the Freedom design, a semi-planing steel monohull designed to operate close to shore in the littoral, able to provide an array of flexible and easy to switch out mission packages. Milwaukee measures 389 x 57 ft. with a 13.5 ft. draft and full load displacement of approximately 3,400 metric tons. Courtesy of its combined diesel and gas turbine power plant driving waterjets, its top speed is greater than 40 knots. Central to both LCS designs is the reduction of crew size with a corresponding increase in mission flexibility. To this end, Milwaukee’s crew of 40 sailors can launch and recover watercraft in conditions to Sea State 4; and launch and recover aircraft in conditions to Sea State 5. Milwaukee’s core self defense suite includes 3D air search radar, rolling airframe missile, medium caliber gun, electro-optical infrared gunfire control system and a decoy launching system. The ship’s sponsor was Mrs. Sylvia M. Panetta, and speakers included Chuck Goddard, President and CEO, Marinette Marine; Joe North, VP, Lockheed Martin; VADM Tom Copeman, USN Commander, Naval Surface Forces, U.S. Pacific Fleet; and the Honorable Sean Stackley, Assistant Secretary of the Navy, Research, Development and Acquisition. The U.S. Navy awarded the contract to construct Milwaukee in December 2010. The ship is one of four LCS currently under construction at Marinette Marine. Following christening and launch, Milwaukee will continue to undergo outfitting and testing before delivery to the Navy in 2015. The Lockheed Martin-led team designed and built USS Freedom (LCS 1) and USS Fort Worth (LCS 3). USS Freedom recently departed from the U.S. 7th Fleet following successful multi-national maritime exercises during her deployment to Southeast Asia. USS Fort Worth has completed her scheduled maintenance period and is currently in her San Diego homeport. Detroit (LCS 7), Little Rock (LCS 9) and Sioux City (LCS 11) are in various stages of construction at MMC. Wichita (LCS 13) and Billings (LCS 15) are in the early stages of material procurement. If you hopped in your vehicle and drove 1,184 due south (this is not simply writer hyperbole: Marinette, Wis., lies at 87.6306 degrees West; Mobile, Ala., lies at 88.0431 degrees West) you would find yourself at the second production facility for the Littoral Combat Ship program, Austal USA in Mobile, Alabama. Austal USA builds the Independence variant of the LCS, an aluminum construction trimaran that measures 417 ft. with long with a 14.8 ft. draft. It, too, is able to exceed 40 knots, able to launch and recover watercraft in conditions up to Sea State 4; launch and recover aircraft in conditions up to Sea State 5. The Independence variant features a massive mission bay with a volume of 11,000 m, and a range of more than 3,500 nautical miles. Last month Austal launched the future USS Jackson (LCS 6), unique in that it was the first ship built in Austal’s new 59,000-sq. ft. assembly hall, Bay 5. The launch was conducted in a multi-step process involving Berard Transportation’s self-propelled modular transporters (SPMTs) to lift the entire 1,600-metric-ton ship almost three feet in the air and moving it 400 feet onto a moored deck barge. The deck barge was then towed a half mile down river to BAE Systems’ Southeast Shipyard where it was transferred to BAE’s floating dry dock, the Drydock Alabama. The floating dry dock was submerged with Jackson entering the water for the first time. Jackson was then towed back to Austal USA’s facility, where it will undergo final outfitting and activation before sea trials and delivery to the Navy. This vessel is the first of ten 127-meter Independence-variant LCS class ships Austal has been contracted to build for the U.S. Navy as prime contractor subsequent to a $3.5 billion block buy in 2010. Austal’s teaming partner, General Dynamics Advanced Information Systems (a business unit of General Dynamics) is the ship systems integrator, responsible for the design, integration and testing of the navigation systems, C4I, and aviation systems. The ship’s flexible open architecture computing infrastructure (OPEN CI), designed, developed, and integrated by General Dynamics Advanced Information Systems, allows “plug and play” integration of both the core systems and the LCS mission modules. The LCS program is in full swing at Austal USA with four ships currently under construction. Coronado (LCS 4), delivered to the Navy in September, will sail away soon with a commissioning ceremony in Coronado, Cal. in April. Montgomery (LCS 8) is being assembled in Bay 4 in preparation for launch in the spring. Construction is well underway in Austal’s Module Manufacturing Facility (MMF) on Gabrielle Giffords (LCS 10) and Omaha (LCS 12). Fabrication on Manchester (LCS 14) is scheduled to begin in early 2014. While the Littoral Combat Ships themselves are testaments to advances in marine technology and modern, flexible weaponry and performance packages, a peak behind the scene at the shipyards tells the real tale, as both Marinette Marine and Austal USA have invested mightily to deliver what are arguably the most modern and efficient ship production facilities in the country. Austal USA set up shop in Mobile, Ala., in 1998, initially with a single shipbuilding shed. The evolution of the yard, particularly through the eyes of someone who saw it first at start-up and then not again until late 2013, is nothing short of stunning. More than a decade and $300m in investment later, the ship construction facility in Mobile has evolved into a true vessel construction production line, where every piece of material, every piece of equipment, every ship module is well choreographed to minimize unnecessary time and handling, resulting in a straight path from design to delivery. While the shipyard is vast, still growing and impressive, the centerpiece is the Module Manufacturing Facility (MMF) which sports two side-by-side manufacturing lanes, a straight path linear, highly automated workflow which takes in material from one end and from the sides, moving it down the manufacturing lanes on rolling jigs and producing finished modules on the other end. The aim of the facility is simple enough: improve quality and reduce costs. “It’s simple; it makes sense … but it’s something that no one has ever done,” said William C. Pfister, Vice President, Strategic Facilities Development, Austal USA. While both lanes could be used for the same ship, today Austal uses one lane for the LCS program, the other for the Navy’s Joint High Speed Vessel (JHSV) program. It was only three years ago when ground was broken for Phase 2 of the MMF, the second line of the MMF which doubled existing manufacturing floor space to 700,000 sq. ft and add 30,000 sq. ft. of office space. As completed, the facility is able to build six large aluminum vessels such as the Navy’s LCS and/or JHSV per year. Assembly Bay 5, from which the future USS Jackson (LCS 6) recently emerged, features 59,000 sq. ft. of floor space, 425 ft. long by 135 ft. wide and is similar to that of the existing Assembly Bays 3 and 4, with the ability to join with the future expansion of Assembly Bay 6. 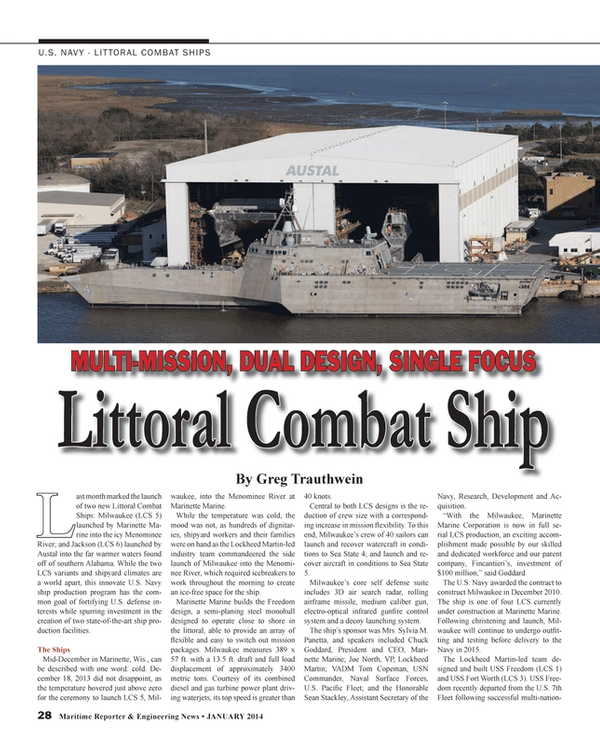 “I’m so proud of our team, especially when you consider how fast we’ve grown over the past few years while still being able to successfully support this very important program with these cutting edge, high quality, highly capable yet cost-effective warships,” said Craig Perciavalle, Austal USA President, on the launch of LCS 6. Austal’s growth is not captured solely in buildings and machines. The shipyard has become a prime employer and technical talent developer in the region, adding 3,000 employees since November 2009. While Maritime Reporter was not able to tour the physical facilities at Marinette Marine during the recent christening and launch of LCS 5, Francesco Valente, President and CEO of Fincantieri Marine Group, was available for comments on the sidelines of the event that day. In the Spring of 2013 Marinette Marine held a ceremonial ribbon cutting ceremony to commemorate the opening of its newest facility, and to mark the completion of Fincantieri’s $74m investment in the shipyard. “With new facilities, computer-controlled manufacturing equipment, the best engineering minds in the business, and the industry’s finest master craftsmen,” said Goddard at the event. The $74m invested since Fincantieri took over in 2009 is easy to see, as MMC has doubled its indoor production space and increased its workforce by 60% to 1400 employees. The shipyard, with purpose designed facilities, has geared up toward not only cutting edge technology to maximize production efficiency but also to minimize energy consumption. The investment in MMC was necessary for the yard to meet and exceed the US Navy’s requirement to deliver two LCS per year, leaving the company with additional capacity to pursue other programs, such as the USCG’s Offshore Patrol Cutter. “The challenge here was to transition this yard, which already had a very long history building ships,” said Valente. “But the history was building ships one at a time most of the time. We have brought in a different mentality, an industrial mentality with the focus on series production. So today we have five of the LCS ships in production, as well as the ARV, a research vessel. This is building six ships at the same time, and with that you have to develop a different mindset; a cultural development focused on industrial, serial production.